When most foragers think of wild spring greens, their minds go to dandelion greens and chickweed or any number of other herbaceous spring greens. A wild salad is made with wild weeds, that’s just the way it is. But in the early spring, growth is fresh tender and edible well into the canopy. There are a number of trees with tasty edible leaves, all you have to do is channel your inner giraffe. Spruce tips are tender and flavorful for teas and homebrew, and redwood needles can be baked into cookies among other things. For a real treat, look for linden trees. Every part of the linden tree is edible, and in the early spring, the leaves are especially delicious salad greens. If you can catch a linden early enough, the unopened leaf buds are a real treat. On my homestead in Vermont, they are just forming in mid-May when there’s very little else edible or green. Linden buds taste fresh, green and extremely sweet. For that early in the season, on a palate that’s been eating winter comfort food for months, they tasted exactly like sugar snap peas. The leaves are edible all summer long, but they’re best small. 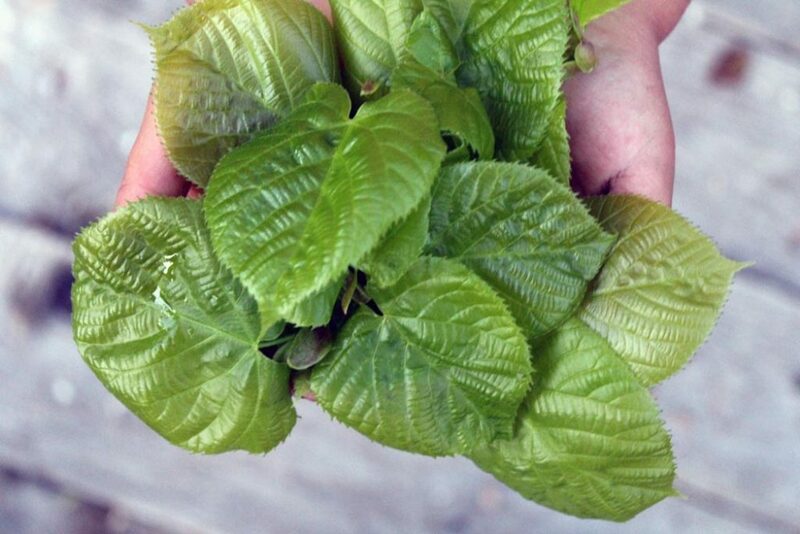 Late may through Mid June is the best time for eating linden leaves in the north country, and it’s a bit earlier in more reasonable latitudes. The leaves can be munched directly off the tree, and they make a sweet and fresh tasting trailside snack while hiking. I’ve yet to try them cooked, but I think they’d make a lovely and mild dolma wrapper. If cooked, their season would likely extend considerably because the cooking process would help to tenderize mature leaves. 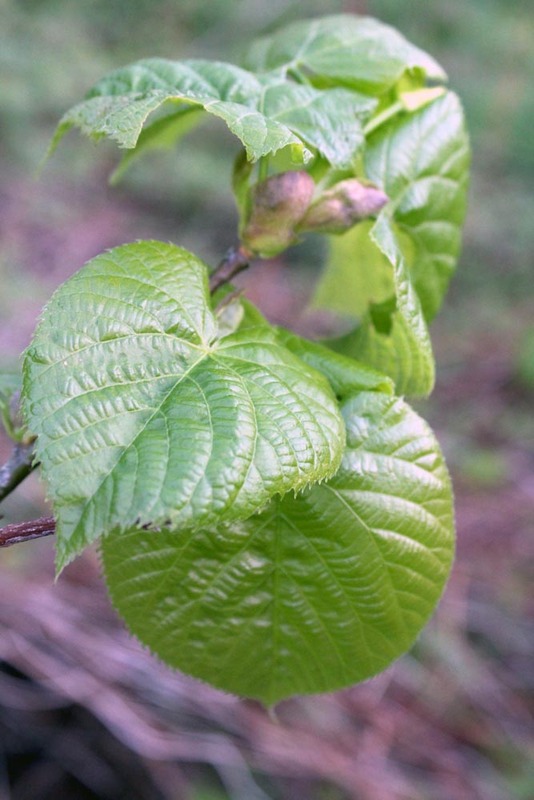 Later in the season, it’s easy to identify the leaves by their shape and size. They’re absolutely huge, often as big as your face. When they’re just growing in, you’ll have to rely on their shape and bright green color. The new spring leaves are so bright green that they almost seem to glow fluorescent in the light. It can be tricky to harvest the leaves from mature trees because they can grow quite tall. Often enough, a mature tree will send up new growth from the bottom if there’s ample sunlight. That’s your best chance to harvest because the leaves will be low on the new growth. Look for linden trees where light is penetrating through to low on the trunk, like along a roadside, suburban driveway or trail. They’re planted as street trees in some areas, so they’re also available in urban areas. You can also harvest a few leaves off a young tree that isn’t a majestic forest giant quite yet. More often than not the young trees have multiple trunks and side shoots, which will give you plenty of leafy options to choose from. The leaves pair well with other fresh spring greens and are particularly tasty for children who don’t have the tolerance for bitter greens quite yet. They have a soft, almost buttery texture and a mild green flavor with hints of sweetness. They add a hint of softness to a wild salad that’s full of traditional bitter spring greens like dandelion leaves. For a little color, toss in a few violets or other edible flowers. As linden leaf season is coming to a close, look for the very first linden flowers. Linden flowers are medicinal and can be used in much the same way as chamomile. They’re gentle and relaxing, and help calm the nerves and promote restful sleep. They’re most commonly brewed into a sweet and floral linden tea. Eat the early linden greens fresh while they last, and then dry the flowers for use all year long.